This very distinctive beetle always captivates our guests—it’s one of the largest beetles around! 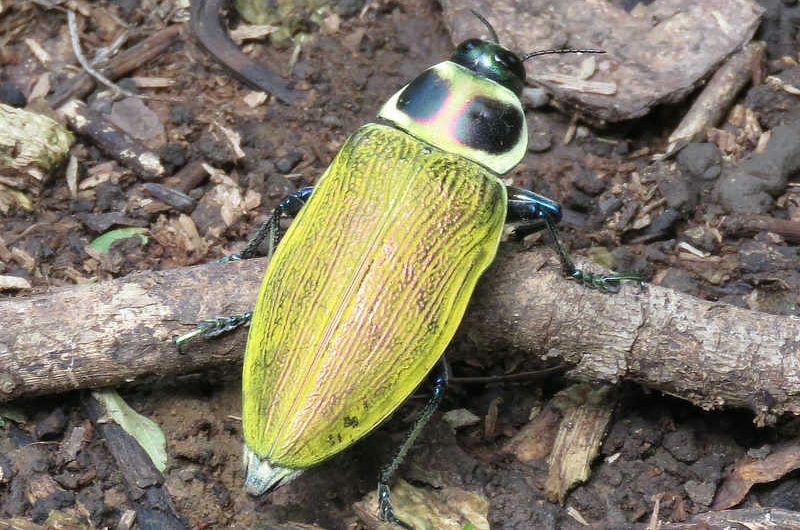 In addition to its whopping size (5-8 cm), its robust, elongated body and hard elytra (outer wings) are an attractive metallic green with purplish and reddish tinges; however, often this shiny exterior is covered with a yellowish waxy powder coating, most prevalent on newly emerged adults, and wearing off as the beetle ages. Its pronotum (prothorax) has two distinct large black spots. This species has large eyes and segmented antennae. The larvae of the Giant Ceiba Borer are huge—the 12-15 cm grub which bores through fallen timber, feeding on decaying wood mostly of the Bombaceae family (softwood species including Ceiba, Pseudobombax and Ochroma), but also on Ficus species. They have a special gut bacteria that breaks down cellulose and helps digest wood. Adults are typically found walking around on the surface of tree trunks and thick branches, and they feed on leaves and pollen, frequently visiting flowers. They are diurnal, spending time sunning themselves on trees, and move slowly unless alarmed. Giant Ceiba Borers typically breed and lay eggs in August. Males produce a clicking sound with their elytra to attract females. Females lay eggs on decomposing logs, eggs are laid in four groups of 10 eggs on one stump, and the female will lay up to 240 eggs throughout her lifetime. Grubs take up to 2 years to develop, and receive no parental care. Giant Ceiba Borers are one of the largest members of the family Buprestidae (the metallic wood-boring beetles) and the only member of the genus Euchroma. Members of this family are notorious for damaging trees, and this species can possibly cause sufficient tree damage by eating the roots to cause the tree to fall. They don’t have many natural predators, due to their protective thick elytra; however, indigenous people in some countries collect them to use their beautiful elytra as jewelry or ornaments. Giant Ceiba Borers are found throughout tropical America from Mexico south to Argentina, mostly in the lowlands up to 1200 meters in elevation. Keep an eye out for them on tree trunks around the Canopy Family lodges, they are quite the sight to see! Did you know? The yellowish waxy powder on their elytra is thought to protect them from the sun and to hold in moisture.